11.33.030 General standards and limitations. 11.33.040 Required parking by land use. 11.33.050 Parking space size and location. 11.33.080 Urban mixed-use zone requirements. 11.33.100 NL zone parking requirements. The purpose of this chapter is to establish regulations for the provision of off-street parking and loading for all land uses. The standards of this chapter are intended to ensure that adequate off-street parking and loading facilities are provided in conjunction with all land uses to facilitate community-wide accessibility; promote the viability of business within South Gate; create safe and attractive streets; and promote the use of a full range of mobility options, including walking, bicycling, and transit use. A. Applicability. The provisions of this chapter shall be applied to the establishment, development, redevelopment, expansion, and modifications of any land use in the city. No building or structure shall be occupied, and operations associated with a land use shall not commence, unless off-street parking and loading facilities conform to the requirements of this chapter. 1. Shared Parking Programs. Shared parking programs or areas may be established with centralized off-site parking or reduced parking standards per Section 11.33.110, Trip reduction measures. 2. Parking Districts. Land uses participating in a vehicle parking district shall be subject to the parking and loading requirements of the applicable program, as provided for in Section 11.33.120, Park-once/parking districts, or as subsequently established. 3. Modifications. Parking requirements of this chapter may be modified or reduced through the standards of Table 11.30-1, Administrative Modifications, or an administrative permit. Any modification or reduction in parking shall be subject to the discretion of the director based on the specific conditions and on-site personnel of the land use. 4. Existing Permits. When parking requirements, as set forth in this chapter, are amended, such amendments shall not invalidate a previously approved permit. The standards of this section are applicable to all land uses in all zones, unless otherwise specified. A. Use of Parking Areas. Parking spaces regulated in this chapter shall be solely used for parking, and may not be used for the display of merchandise; storage or display of equipment; display for sale or lease; or repair of vehicles, trailers, recreation vehicles, boats, or other vehicles/equipment, except where expressly permitted by a temporary use permit. B. Usable Existing Spaces. Required or provided parking spaces shall be maintained clear of any utility or other structural interference, regardless of any permits previously issued. C. Required Availability and Maintenance. All required parking and loading areas shall be available during all hours of operation, marked for their intended uses, and reserved for parking and loading purposes for the life of the use or facility. D. Existing Facilities. The building or use associated with a parking facility that becomes substandard by the adoption of this chapter shall be considered a nonconforming use and allowed to continue operation. Modification to the building or use shall be subject to conformance with the parking standards of this chapter based on the following. 1. One enlargement or expansion limited to one percent of the total building area may be permitted without increasing parking to the standards of this chapter. 2. All additional enlargement or expansion shall be contingent upon concurrent provision of the required number of parking spaces or parking area as designated by this chapter. E. Change of Occupancy or Use. Off-street parking facilities and loading shall be provided in compliance with the minimum requirements of this chapter, including change of occupancy, a new business license, or enlargement of a structure or use where the parking demand is increased. This requirement shall not be applicable to mixed-use parking developments in cases where a use changes from one commercial type to another commercial type; see Section 11.33.080, Urban mixed-use zone requirements, for mixed-use parking standards. F. Parking of Inoperable or Unregistered Vehicles. Except as set forth in this chapter, it shall be unlawful for any person to park or store an automotive vehicle or trailer in inoperable condition or without current registration from the Department of Motor Vehicles, except when stored in a fully enclosed building or fully enclosed garage. G. Parking and Driveway Requirements – Residential Uses. Legal nonconforming properties built without garages may pave and make use of one driveway space, maximum twelve feet wide, within the front yard setback. Any planters, additional paved area, or structures in the front yard setback area require approval by the community development director. The parking of motor vehicles or trailers of any kind in the front yard setback area outside the approved driveway surface is prohibited. The requirements of this section shall be applied uniformly based on land use, regardless of the zone in which a land use is located, unless otherwise specified. A. Minimum Standards. Every land use shall provide at least the minimum number of off-street vehicular parking spaces required by Table 11.33-1, Minimum Required Parking by Land Use, and Table 11.33-4, Mixed-Use Parking Requirements. Reductions to the parking requirements may be permitted, subject to Section 11.33.020, Applicability and exemptions, and subsequent referenced sections. 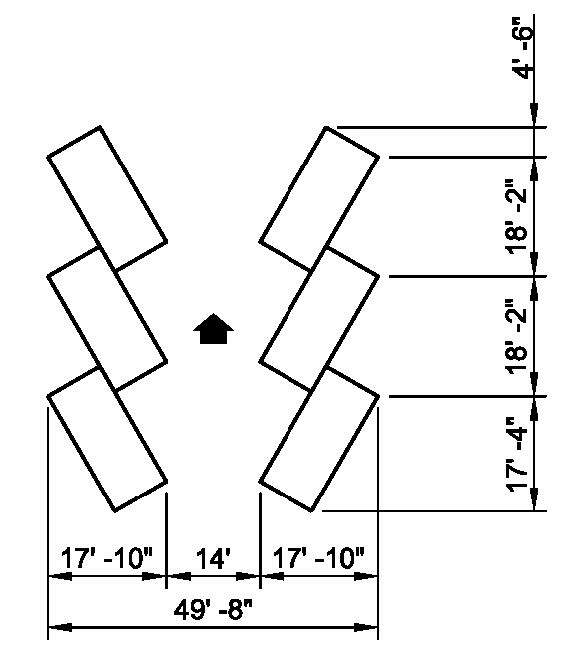 Required parking space dimensions, based on parking configuration, are established in Section 11.33.050, Parking space size and location, and Table 11.33-2, Parking Dimensions. B. Uses Not Listed. Parking requirements for a land use not specifically listed in Table 11.33-1 shall be determined by the director based on comparable uses in the table or through a parking demand analysis of similar facilities in the region. C. Rounding Calculations. Calculations resulting in a fractional number shall be treated as follows: One parking space is required for fractions of one-half or greater; no additional parking space is required for fractions of less than one-half. 1. Gross Floor Area Calculations. Gross floor area calculations are based on the area within the surrounding exterior walls of a building or any portion thereof, including shared bathroom spaces, storage areas, and areas for circulation. 2. Seating Calculations. Where fixed seats provided are either benches, bleachers, or pews, such seats shall be calculated at one seat per eighteen inches, and one seat per twenty-four inches of booth length for dining. 3. Assembly Area Calculations. All rooms or areas that can be logically used for seating, in addition to any fixed seating area, shall be calculated in determining the parking requirement for assembly areas. 40, plus 1 per 50 sq. ft. over 4,000 sq. ft.
25, plus 1 per 150 sq. ft. over 5,000 sq. ft.
1. Parking shall be evenly distributed throughout storage area. Requirements: one-way drives: eighteen-foot-wide parking and travel lane; two-way drive: twenty-six-foot-wide parking and travel lane. DU = dwelling unit; gfa = gross floor area; sq. ft. = square feet/foot. All land uses in all zones shall provide the required off-street parking spaces in accordance with the location and dimensional requirements in this section. A. Parking Space and Driveway Sizes. 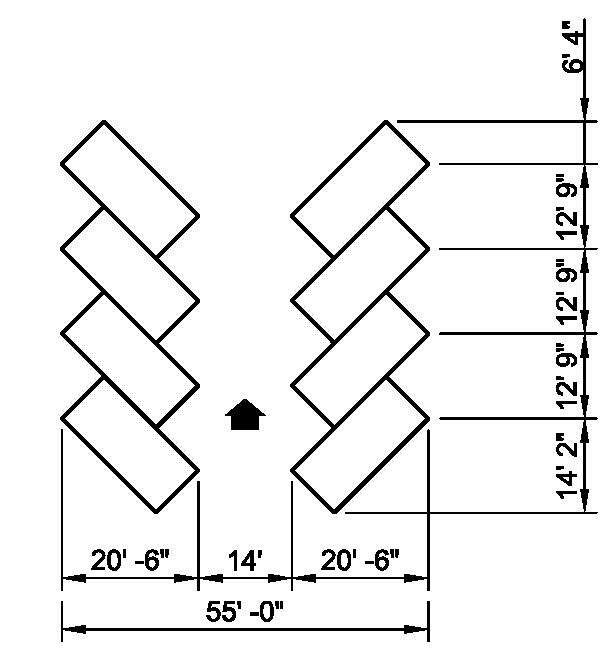 Table 11.33-2, Parking Dimensions, regulates minimum off-street space dimensions and drive aisle requirements for various angles of parking. 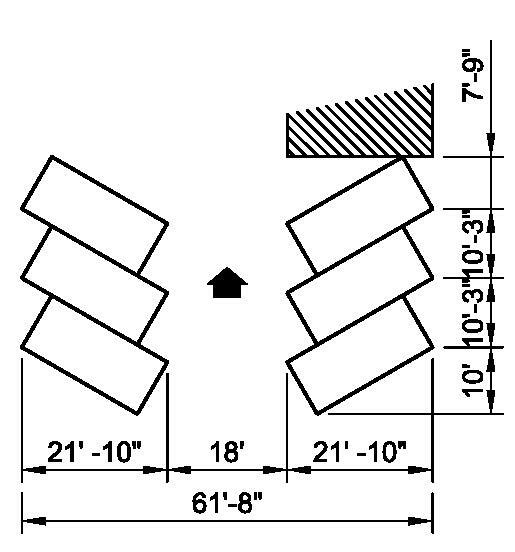 See Figure 11.33-1, Parking Dimensions, which supplements Table 11.33-2, and Diagrams A through F. Driveway width shall be equal to the drive aisle width subject to Table 11.33-2. 1. Measured perpendicular to aisle. 2. The paved parking space length may be decreased by up to two feet by providing an equivalent vehicle overhang into landscaped areas or other paved walkways. 3. Driving aisle shall be unobstructed; one-way aisles shall be serviced by appropriate turn-around or pull-through configurations. 4. End spaces may be reduced to eighteen feet. ft. = feet; in. = inches. B. Compact Parking Spaces. Compact parking spaces may be used to meet minimum parking requirements, subject to the following standards. 1. Dimensions. 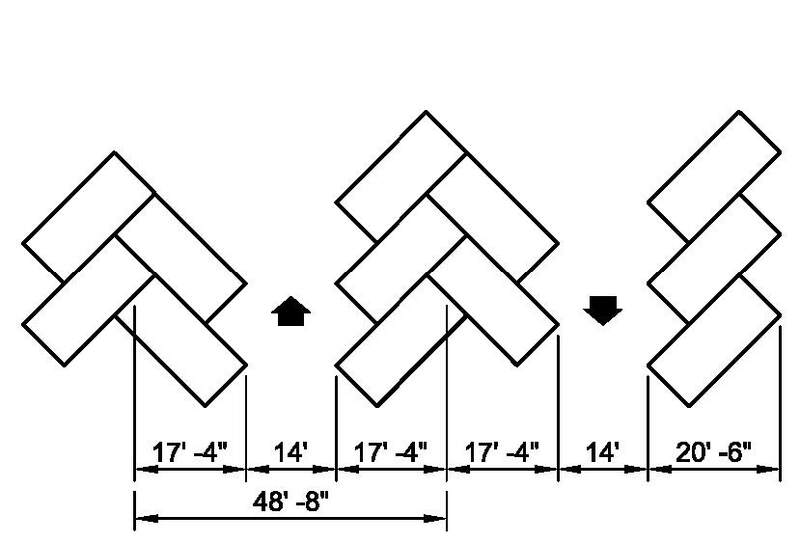 Spaces shall be the minimum size specified in Table 11.33-2 and illustrated in Figure 11.33-1. 2. Allowed Spaces. Compact spaces may be permitted to comprise twenty percent of the minimum required parking spaces. 3. Designation of Parking. “Compact” shall be clearly marked on the pavement or curb to designate spaces. 4. Distribution of Spaces. When included, compact spaces shall be distributed throughout the parking area, and shall not be provided disproportionately near building(s). The standards of Table 11.33-3, Parking Lot Standards, and this section shall apply to the design of all public and private parking lots, vehicle storage areas, and vehicle sales/rental areas for new construction and remodeled existing land uses in all zones. 1. Forward Movement. All access and circulation shall facilitate vehicles (including trucks and solid waste, emergency, and other public service vehicles) entering and exiting a facility or lot without backing up into a public street, reentering a public right-of-way, or making other hazardous turning movements. 2. Turnarounds. If such circulation is not possible, a turnaround area shall be provided, subject to the requirements of the city fire department or engineering division. B. Parking Location. Off-street parking for nonresidential land uses shall be provided in a paved parking lot or within a building, with a maximum walking distance as indicated in Table 11.33-3, Parking Lot Standards. Required minimum setback to parking is regulated by the applicable zone. Where a minimum setback is regulated by a maximum percent of the frontage. C. Ingress/Egress. Parking driveways and access points shall not disrupt the pedestrian right-of-way on primary streets. Ingress/egress shall comply with the Revised Standard Driveways Plan No. M-11.59, adopted by the city council. Refer to Section 11.23.070(F), Vehicular Driveway Access, for ingress/egress standards related to pedestrian-oriented uses. 1. 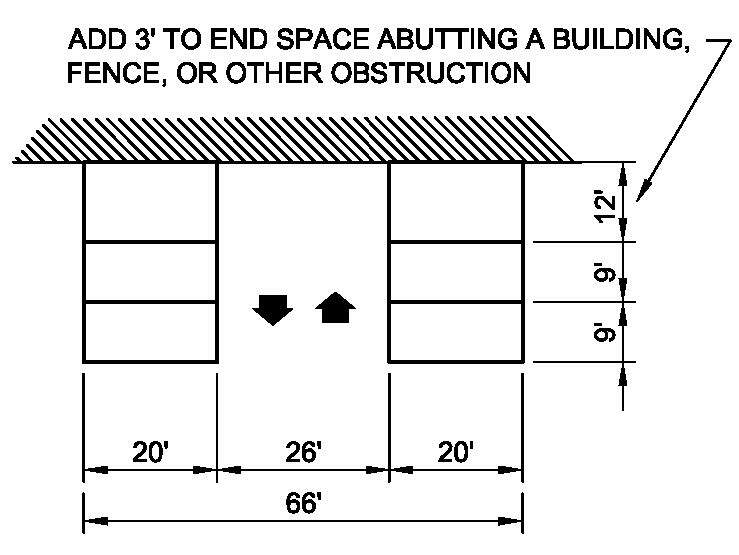 Rear or interior walls may be permitted to be up to eight feet maximum when adjacent to a parking lot. Barbed wire is prohibited. PL = property line; NL = neighborhood low; NM = neighborhood medium. 1. Passenger loading areas shall be located next to the primary pedestrian access from the parking area to adjacent building(s). 2. Passenger loading areas shall be designed to include a turnout large enough to accommodate waiting vehicles equivalent to one-half percent of required parking for the project. E. Plan Review. All common parking lots, including location, dimensions, landscaping, and building access, shall be clearly defined on the proposed development plan (administrative plan review, discretionary plan review, or standard application site plan as applicable). 1. Maneuvering. Maneuvering areas shall be designed consistent with Table 11.33-2, Parking Dimension, and Diagrams A through H.
2. Ramps. 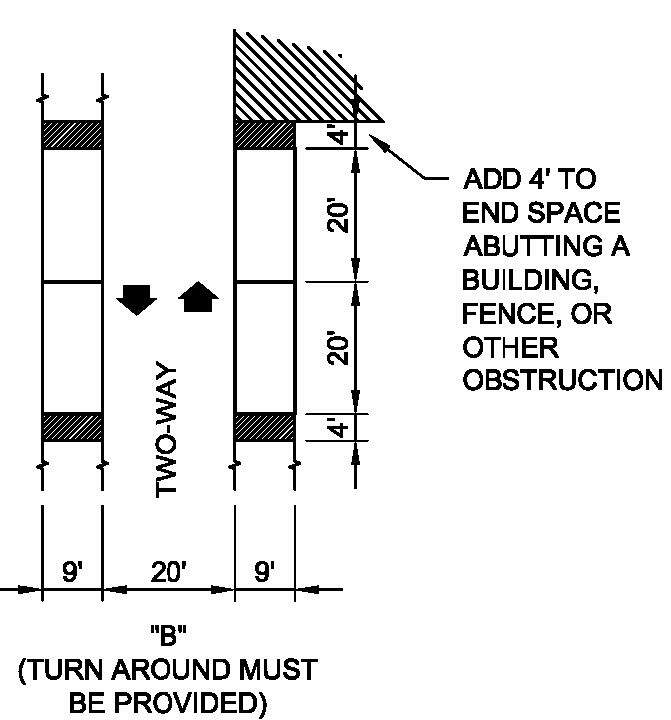 Vehicular driveway ramps shall be designed consistent with Table B. 3. Surfacing. Parking lots shall be surfaced and maintained with cement concrete or asphaltic concrete, a minimum of three inches in thickness, so as to eliminate dust or mud, and shall be so graded and drained to dispose of all surface water. Drainage shall be taken to the curb or gutter and away from buildings and adjoining property. The following guidelines are applicable to all zones, and should be applied to the design of freestanding parking structures or where structures have a major presence on the street if attached to other uses like a hotel, office, or multifamily residential building. A. Architectural Character. Whether public or private, freestanding parking structures and integrated parking podiums should be treated as buildings and follow the same principles as good building design. Providing an exterior façade composed of high-quality materials that screen the underlying concrete structure will elevate the building’s stature and contribute to the overall quality of South Gate’s architecture. B. Architecturally Compatible. Parking structures should be compatible in architectural treatment with the architecture of the buildings they serve. C. Signage. Signage and wayfinding should be integrated with the architecture of the parking structure. D. External Design. Parking structures shall have an external skin designed to improve the building’s appearance over the basic concrete structure of ramps, walls, and columns. This can include heavy-gauge metal screen, precast concrete panels, laminated glass, photovoltaic (solar) panels, landscape features, architecturally interesting walls, or a combination of these features; see Figure 11.33-2. E. Sustainability. Parking structures should integrate sustainable design features such as photovoltaic panels (especially on the top parking deck), renewable materials with proven longevity, and stormwater treatment wherever possible. F. Circulation. Vertical circulation (elevators and stairs) shall be located on the primary pedestrian corners and be highlighted architecturally so visitors can easily find and access these entry points. G. Active Ground-Floor Uses. On retail-oriented streets or building frontages, parking structures shall incorporate active ground-floor uses along the street frontage of the garage. H. Lighting. Lighting fixtures in parking areas, ingress/egress areas, and all internal circulation areas shall be directed and shielded appropriately to not illuminate surrounding properties. See standards in Table 11.33-3, Parking Lot Standards. iii. Parking structure entryways and lobbies. 2. All lighting fixtures, including building-mounted lighting and pedestrian fixtures, shall adhere to the standards of this title. 3. Lighting fixtures in parking areas, ingress/egress areas, and all internal circulation areas shall be directed and shielded appropriately to not illuminate surrounding properties. 4. See standards in Table 11.33-3, Parking Lot Standards. In addition to the standards of Section 11.33.030, General standards and limitations, and Section 11.33.040, Required parking by land use, the following standards shall apply to development within the urban mixed-use zones. A. Urban Mixed-Use Zone Character. Parking should generally be provided through a combination of off-street spaces behind buildings, on-street customer spaces, and park-once/public parking. Parking should generally be hidden from view; ideally, parking should be provided behind buildings, wrapped with active uses along the public frontages, or below grade. B. Mixed-Use Parking Requirements. Table 11.33-4, Mixed-Use Parking Requirements, establishes parking requirements for mixed-use developments. Parking shall be provided on a generalized land use basis, and the applicant shall demonstrate the adequate provision of spaces per individual land use. Aggregate number of parking spaces may be reduced through a shared parking program per Section 11.33.110, Trip reduction measures, administrative modification per Section 11.30.030, Administrative modifications, or an administrative permit per Section 11.33.020, Applicability and exemptions. 1.0 per 250 sq. ft.
1.0 per 200 sq. ft.
1.0 per 100 sq. ft.
sq. ft. = square feet; n/a = not applicable. 1. At-grade parking should be located at the rear half of the lot wherever possible. 2. All parking, including podium parking, at-grade parking, and surface lots, should be set back from the street, behind an active building use. The intent of the parking setback is for the parking area and parked cars to be located away from view. 3. When architectural solutions are not possible to screen a parking lot or structure, a landscape screen, green screen, or street screen should be used. The screen should be cohesively designed with the building or garage, and should also be visually consistent with the existing or proposed streetscape. See Figure 11.33-3. 5. If a garage has a well-designed exterior and/or a building screen that includes active uses, it does not need to be screened using dense landscaping. 1. Access to parking should be primarily from side streets or alleys. If access from side streets is not possible due to lot location and/or configuration, vehicular access shall be constructed so as to minimize the disruption of the pedestrian right-of-way on the primary streets. 2. Parking lanes and connecting driveways shall be comprehensively designed to facilitate internal lot circulation without backing up into a public street, reentering a public street, or making other hazardous turning movements. 3. A safe and convenient zone in which vanpool and carpool vehicles may deliver or board their passengers should be incorporated within the design of parking lots. Also, safe and convenient access from the external circulation system to bicycle parking facilities on site should be incorporated. 4. 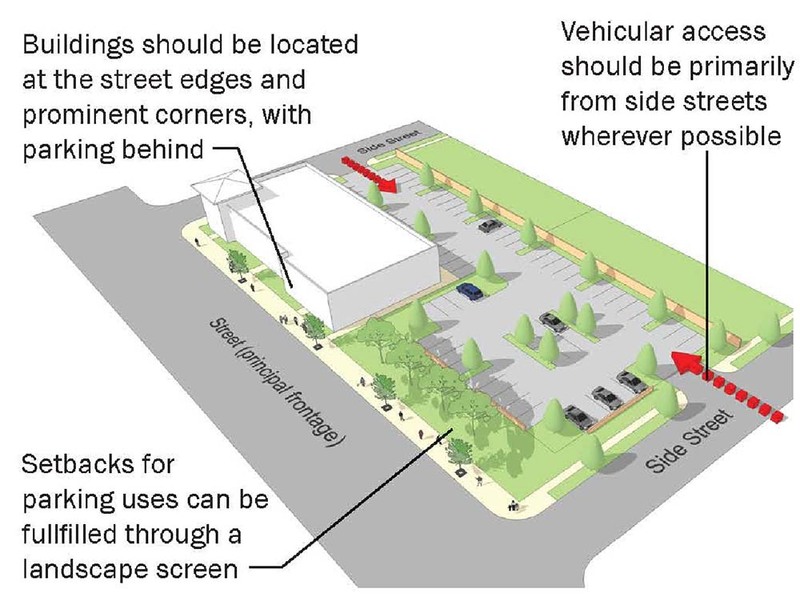 Parking lot design should incorporate sidewalks or other designated pathways, allowing pedestrians to follow direct and safe routes from the external pedestrian circulation system to each building in the development. 5. If determined necessary by the city to mitigate the project’s impact, bus stop improvements must be provided. The city will consult with local bus service providers to determine appropriate improvements. When locating bus stops and/or planning building entrances, entrances must be designed to provide safe and efficient access to nearby transit stations/stops. 1. A minimum of ten percent of every parking lot shall be devoted to landscape. 2. Surface parking should be divided into smaller landscaped lots or courts, with defined pedestrian connections, landscaping, and shade trees. 3. 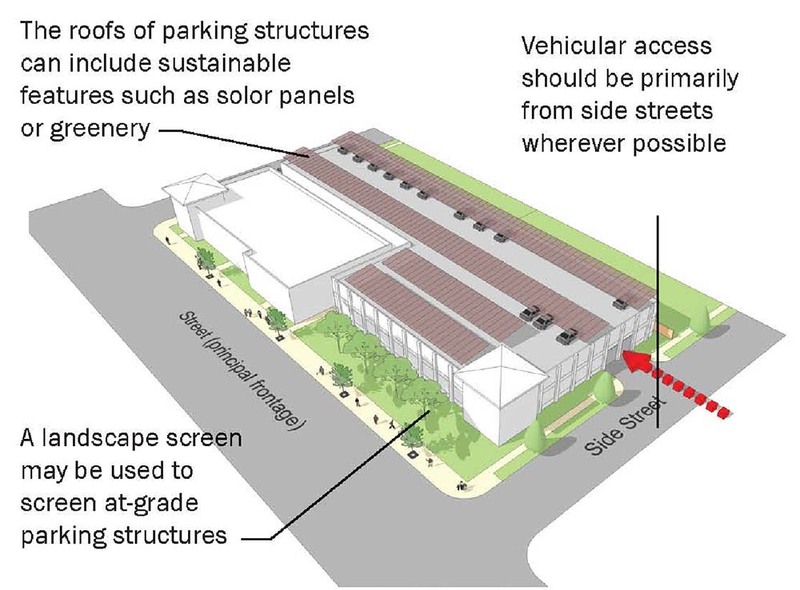 Surface parking lots should include ample shade trees to reduce the heat island effect and mitigate views from surrounding buildings and streets. 4. Twenty-four-inch to forty-eight-inch box trees are preferred. 1. Security. Only bicycle racks or bicycle storage lockers will be counted as bicycle parking. 2. Visibility. Bicycles or bicycle storage lockers should be easily visible from building entrances, security offices, lobbies, public areas, and nearby walkways. 3. Lighting. Bicycle parking areas should be adequately lit. 4. Convenience. Bicycle parking areas should not obstruct pedestrian or vehicular traffic flow, and should be placed where riders can safely and easily dismount, and walk to building entrances. Fractions shall be rounded up to whole numbers. Parking structures should be well designed so that they contribute to a pleasant pedestrian experience. Parking lots should be generally hidden from views into the site. 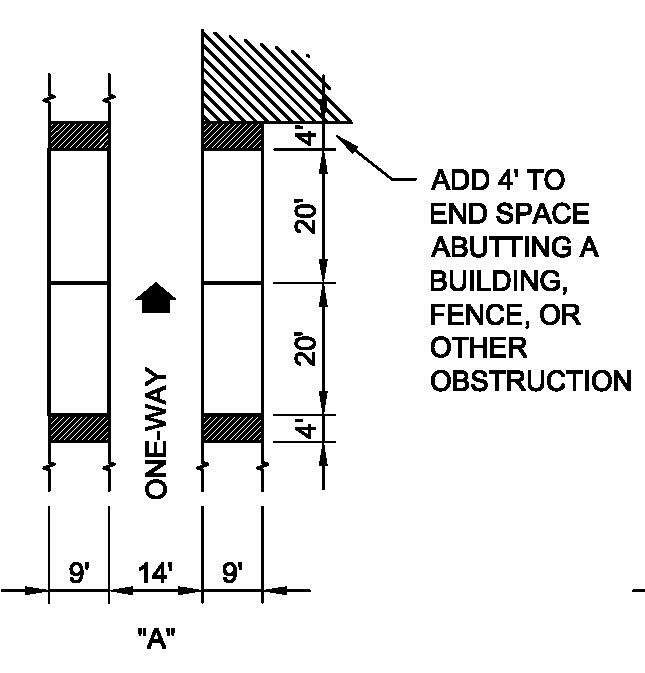 This section and Table 11.33-6, Multifamily Parking Standards, establish the standards for parking, driveways, and garages applicable to all multifamily development in any zone (NM, TV, CC, CDR1, CDR2, UN, and MS zones). A. Location. Parking shall be provided as off-street residential spaces behind or within buildings. All parking for residential uses shall be located on the same site as the residence they are intended to serve, unless provided in permitted off-site locations. Parking shall not be located within a required front or corner side setback. B. Garage Limitation. Parking of any type of regular-use vehicle or equipment shall be limited to designed, approved garages and driveways; parking or storage in any other area is prohibited. C. Street Access Restricted. Garage access directly from a public street for projects of five or more units is prohibited. D. Alley Parking. Parking in an alley is prohibited. E. Driveway Guest Spaces. Driveways with a length/depth of eighteen feet or more may be counted as one guest parking space; they shall not count toward required enclosed parking. 1. Metal carports with decking for roofs are prohibited. Any support posts for covered parking shall be located outside of the designated area of the parking space and cannot be counted as part of the required parking stall width. 2. The design and materials used for covered parking structures shall be compatible with the design of the main structure on the property. G. Decorative Features. Trees, lattice/trellis structures, and/or decorative masonry walls shall be incorporated as part of covered parking design to minimize visual impact. H. Parking and Driveway Requirements – Residential Uses. Legal nonconforming properties built without garages may pave and make use of one driveway space, maximum twelve feet wide, within the front yard setback. Any planters, additional paved area, or structures in the front yard setback area require approval by the community development director. The parking of motor vehicles or trailers of any kind in the front yard setback area outside the approved driveway surface is prohibited. Table 11.33-7, NL Zone Parking Standards, establishes the standards for parking, driveways, and garages applicable to all land uses in the NL zone. A. Parking and Driveway Requirements – Residential Uses. Legal nonconforming properties built without garages may pave and make use of one driveway space, maximum twelve feet wide, within the front yard setback. Any planters, additional paved area, or structures in the front yard setback area require approval by the community development director. The parking of motor vehicles or trailers of any kind in the front yard setback area outside the approved driveway surface is prohibited. 1. Residential remodeling limited to a maximum addition of one hundred square feet, such as the addition of a bathroom or utility room/laundry room. 2. 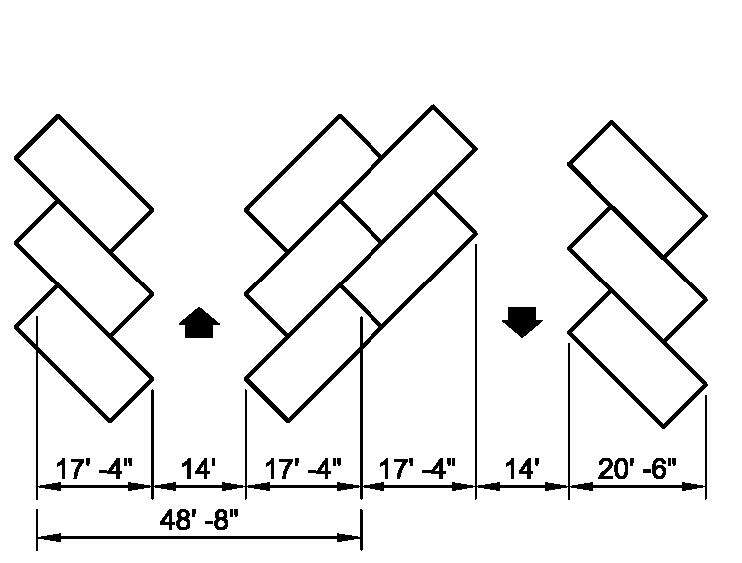 Lot configuration, lot dimensions, or the location of existing structures that make it impossible or impractical to construct an enclosed two-car garage. In such instances, a one-car garage may be authorized by the director. 3. Where only a one-car garage is possible on the lot, the residential unit shall be limited to a maximum of three bedrooms. It is a goal of the city to provide for balanced integration of all transportation modes. To incrementally achieve this goal, all development is encouraged to implement measures to reduce individual vehicle trips. The approaches presented in this section can be used to reduce required parking, consolidate parking provisions, and reduce vehicle trips in the city by supporting alternative modes of transportation. A. Shared Parking Approach. Shared parking plans or facilities may be appropriate in certain areas of the city to reduce the requirements for on-site parking for all land uses. The intent of shared parking is to allow for each property to generate building area, land use activity, and open space as required while grouping the parking facilities in strategically dispersed locations to encourage walking between businesses and destinations and relieving individual properties of providing potentially duplicative parking throughout the identified area. 1. Calculation of the potential nonresidential square feet of the development to be served and the corresponding amount of parking spaces required by this code. 2. Analysis of the types of uses allowed in the area and the projected number of vehicular trips to the area. 3. Analysis of the projected number of vehicular trips to the area and what amount of those trips can be eliminated because of the proximity of adjacent land uses. 4. Based on the above analyses, the number of vehicle trips identified as eliminated because of the ability to visit other uses without needing to move the vehicle a second time (what is referred to as “trip capture”). This amount shall be subtracted from the overall parking requirement identified in subsection (A)(1) of this section. 5. The resulting parking supply and its location identified within the boundaries established by the special requirements and overlay map, or as amended by the city. 6. As development/land use applications are processed by the city, the required parking per the park-once provisions shall be applied, and the applicant shall either provide the parking facility or pay an in-lieu fee to address the applicant’s fair share of the required parking. It shall be the city’s responsibility to monitor the number of parking spaces available and the number committed to nonresidential space in the area. 1. The parking serves special conditions such as proximity to frequent transit service or special characteristics of the population residing, working, or visiting the site. 2. Proposed parking satisfies the requirements for the uses served, as can be demonstrated through a parking management plan. 3. Parking demand generated by the project does not exceed capacity or result in a negative impact on the supply of off-street parking in the surrounding area. 4. Mixed-Use Project. A parking reduction may be granted when the reviewing authority determines that a reduction is justified based on the characteristics of the uses and a parking demand study using the Urban Land Institute’s accepted ratios and/or other appropriate source, as approved by the director. The director may require a parking management plan conducted by a licensed traffic engineer or other traffic professional. C. Transit-Accessible Location. A transit-accessible location is any property within one-quarter mile (one thousand three hundred twenty linear feet) of transit. Property developed as nonresidential, multifamily, or mixed-use may be granted a parking reduction where proposed as a transit-accessible location within one-quarter mile of local or regional mass transit lines or routes. A parking reduction may be administratively applied through the development review process, subject to a parking management plan submitted by the applicant that justifies the reduction based on documented mass transportation use characteristics of patrons and employees of the respective uses. D. Trip Reduction Measures. All major nonresidential development projects shall be required to implement trip reduction measures to ensure the adequate development of alternative transportation facilities or programs, thereby reducing demand for vehicular commute trips. iii. New nonresidential construction and the expansion of an existing nonresidential facility or use by more than two thousand square feet. v. A listing of facilities available for carpoolers, vanpoolers, bicyclists, transit riders, and pedestrians. 3. Preferential Parking for Carpool and Vanpool Vehicles. Office/research and development uses and industrial/manufacturing uses shall provide a minimum of ten percent of required parking as preferred parking for carpool and vanpool vehicles for employees. This shall be a minimum of one carpool/vanpool space per development. i. A statement of available preferential carpool/vanpool spaces for employees and a description of the method for obtaining such spaces shall be included on the required transportation information board. Spaces will be signed/striped as demand warrants. ii. Bicycle Facilities. A bicycle parking facility for bicycle racks or a fully enclosed space or locker accessible only to the owner or operator of the bicycle (to protect bikes from inclement weather) shall be provided. Specific facilities and location (e.g., provision of racks, lockers, or locked room) shall be to the satisfaction of the city. This section establishes standards and requirements for the park-once program and the use of parking districts within the city, which are exempt from the standards of Section 11.33.040, Required parking by land use, if the herein designated conditions are met. A. Park-Once Program. The park-once program is intended to consolidate parking resources, relieve individual properties of providing potentially duplicative parking, reduce individual vehicle trips, and group parking facilities in strategically dispersed locations to encourage walking between destinations. The park-once program area boundaries are identified on the special requirements and overlay zones map (“overlay map”). Each area will be allowed to use a separate shared parking approach to address the needs of nonresidential parking within that area. a. Potential nonresidential square feet, and the corresponding amount of parking spaces required by this title. c. Projected number of vehicle trips that can be eliminated because of the proximity of adjacent land uses. iii. Based on the above analyses, trip capture shall be identified. “Trip capture” describes the number of vehicle trips eliminated because of the ability to visit other such uses without needing to move the vehicle a second time. iv. The trip capture amount shall be subtracted from the overall parking requirement identified in subsection (A)(1)(i) of this section to determine the resulting parking supply for the area. 2. As development/land use applications are processed by the city, the required parking per the park-once program provisions shall be applied, and the applicant shall either provide the parking facility or pay an in-lieu fee to address the applicant’s fair share of the required parking in a facility. It shall be the city’s responsibility to monitor the number of parking spaces available and the number committed to nonresidential spaces in the area identified by the district boundaries. B. Vehicle Parking District. Vehicle parking districts were formerly referred to as “units of comprehensive planned facilities” under the previous zoning code. A vehicle parking district shall be required to provide the equivalent parking that is required by Section 11.33.040, Required parking by land use; Table 11.33-1, Minimum Required Parking by Land Use; and Table 11.33-4, Mixed-Use Parking Requirements, unless requirements are waived or amended as identified in this section. i. Beneficiaries to Facility. Beneficiaries to the Southern Pacific Railroad district shall be restricted to those who make a contribution to the established district. Said contribution shall be in an amount as recommended by the planning commission and as approved by the city council, and shall be at least the pro rata share of the cost of the parking from which the beneficiary is being relieved. The contribution shall be reviewed by the planning commission annually. ii. Impounding of Funds. All funds received pursuant to this section shall be impounded and reserved for future acquisition for parking by whatever means. Funds spent for parking shall be used in the vicinity of the parcels benefiting hereunder in the event that the railroad parking referred to herein is no longer deemed feasible for use by the planning commission. A. Rule 1501. New and existing nonresidential development with one hundred or more employees that are subject to a one-and-one-half average vehicle ridership target by Rule 1501 may reduce the required off-street parking by from twenty percent to forty percent from the standards of Section 11.33.040, Required parking by land use. B. Outdoor Event Plan. The operator of a major outdoor event shall submit a trip reduction plan that shall apply to patrons and employees during the course of the event.